Soulful Southern rockers Whiskey Myers will return in December for their debut headline UK tour; the band – hailing from East Texas – were recently here for the Download Festival (June 12th), and prior to that they made their first visit to these shores Special Guesting with kindred spirits, The Cadillac Three(January / February 2016). Prior to this run of shows, Whiskey Myers (Cody Cannon – Lead Vocals, Guitar | Cody Tate – Guitar, Vocals | John Jeffers – Guitar, Vocals | Gary Brown – Bass | Jeff Hogg – Drums) will have their latest studio album, ‘Mud’, released through Spinefarm Records; the follow-up to ‘Early Morning Shakes’ (2014, also issued via Spinefarm in the UK), ‘Mud’ sees the band reuniting with Grammy-winning producer Dave Cobb (Chris Stapleton, Rival Sons, etc. ), who also helmed their ‘Early Morning Shakes’ outing. A confirmed release date for ‘Mud’ will be announced shortly. 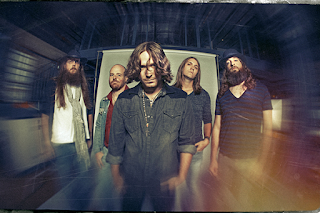 ‘Mud’ sees Whiskey Myers taking their easy style and sound to fresh levels, co-writing a track with Rich Robinson (‘Frogman’, the storming set opener at Download) and generally delivering a set of songs packed with narrative vocals, emotive hooks and twin guitar strength, straddling different genres – including soul, country & classic rock – along the way. Through the quality of their song-writing, plus their undeniable power in concert and on record, the band has attracted a devoted army of home-grown fans who pack out venues, sing their praises online, and continue to make Whiskey Myers a word-of-mouth sensation… and that fervour is now spreading quickly overseas. Wilder than a cyclone, smoother than home-grown….